I joke about being the queen of typos and editing errors. But underneath my self-depreciating humor, I hate myself for making simple mistakes—on math tests in elementary school (is it any wonder why I hate math? ), in the college newspaper when I was editor, on papers I handed in at seminary, and on this blog post. For some reason, I stare until I’m cross-eyed but a little typo or grammatical error also escapes by vigilant efforts. I HATE MAKING MISTAKES!!! Especially stupid ones that could’ve been easily prevented if I JUST PAID MORE ATTENTION. If I just worked harder. To err is human or so the oft-quoted cliché says, but I want to be super-human, or at least the best version of myself. Unfortunately, the best version of me is still prone to errors, faults, cracks, and bumps. Truly, to err is human because humanity is in this fallen state. While all these mistakes seen like a funny, frazzled part of my personality, I wonder if I’ll ever stop hitting my head against the wall for doing what is simply human. Why can I forgive the shortcomings of others and yet beat myself black and blue? Somehow I believed the lie that I SHOULD be perfect, that I won’t make mistakes, that I can do it myself. And when I don’t measure up (and I will never measure up), I am a failure, a waste of space, useless, and I curse the day I was born. I wonder if the world would be better off without someone who makes so many mistakes, who has so many faults. Notice the focus is on me, myself and uh, me. There’s no room for grace. Mercy has no place on my throne because my life and my performance reflects who I am, not Whose I am. Oh, I can pretty it up with some spiritual lingo about how I want to give God my best. But it’s not really God who I am worried about, I know He’ll forgive me. I’m worried about what other people will think about my stupid mistakes. I am more concerned about you seeing my faults and cracks. When you see my faulted humanity, I feel naked, weak, and exposed. I feel less than you and I feel afraid that you will really see me and reject me. One more mistake and you may lose faith in me, walk away from me, or give up on me. So I’d rather throw white-out on those errors. Maybe you’ll see a bump of what was supposed to be there, but that’s between God and me. Besides, you have bumps of your own. You know you do. I’ll hide my bumps and you keep those skeletons in your closet…and we’ll be just fine. Except we’re not fine, are we? We’re wearing masks and living lies. I’m not saying that we have to out every single mistake we make. I simply wonder what life would look like if we were a little more honest. Weakness and humility throws pride to the floor because through our weakness and failures, God gets the glory. There are so many situations when He worked in spite of my mistakes, but because of my submission to Him. Like Paul, I want to start boasting about my failures, my shortcomings, and errors. I want to stop screaming, “REWRITE!” whenever my life takes a plot-twist I dislike. I want to allow God to use all these things, even the bumps, to bring Him more glory. Perfectionism is a pretty way of saying “prideful.” And I don’t know about you, but I’m tired of being full of myself. It allows very little room for God to work. This isn’t going to be an easy process, but at the end of me is where God starts. Let God start here and now. Uncover my bumps. Use my mistakes. Make Your glory known. Something in me says, “You need this, too.” Maybe it’s the still small voice of God, maybe not. This may be the elusive thing I haven’t been able to grasp, despite all the amazing things God has allowed me to do. My gift is to write my soul’s thoughts to encourage the Church, to reach out to my fellow travelers as we meet heart to heart through words. This blog is a solitary act of worship, an expression of my soul to connect with yours. 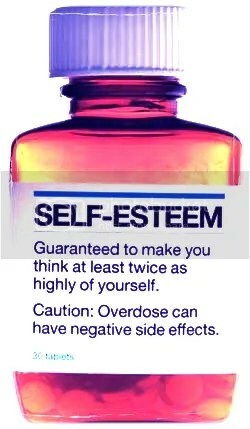 Oh, how I’ve needed this! Oh, how I’ve neglected this. Now that I have an unhidden life, I have to be more careful with my words, for I do not seek to injure others, nor do I want to reveal too much. I must consider what I can share knowing that my friends at church, people I see face to face on a weekly basis (or more), may think of me. It’s a slippery slope, though sometimes I think that life is a slippery slope, which is why we must always God’s direction or we may fall. When I first learned that I broke my foot, I comforted myself with the thought of lying about my apartment—in bed, on the couch—reading, watching documentaries on NetFlix, catching up on my mental to-do list, and writing my little heart out. I haven’t finished one book, watched one documentary, written a to-do list, yet I have been writing…in my journal. While these conversations with God are precious and private, I feel that my silence has added to my struggle with identity. Oh, I know my identity is in God alone! I know He created me and He defines me and He tells me who I am! I know this! But…sometimes it’s difficult to explain that to others when they ask me what I do. It’s a long story. A really long story. Fortunately, my faithful family (which includes dear friends) knows my story as do you, my loving readers, because you’ve been on this journey with me for years. Even though I’ve spent so much of the past year in silence, even though some of you have wandered to other blogs, know I appreciate you, pray for you, and cherish you. Writing for you to make my joy complete (see post) has fallen by the wayside. And part of that is my fault, for chasing after things that don’t add life. Things which, in fact, break my heart. God says, “No.” Quietly, patiently, lovingly He says, “No, this is not my best. You can have this thing you so desire, but I have something even better in mind. Just you wait and see what I will do!” I imagine a glimmer in His eye; I hear a hint of it in His voice. And even though I don’t like surprises, I know whatever He’s planning, working, creating is good because God is good. I’m sorry for not being there for you, for chasing after that which does not satisfy, for that which leaves me longing for more. I told you I would write to make my joy complete, that I would let the Holy Spirit fill me with all joy…and I meant it then and I mean it now. Sometimes I get distracted by the scenery on the side of the road; it comes when you write from the backseat, I guess. 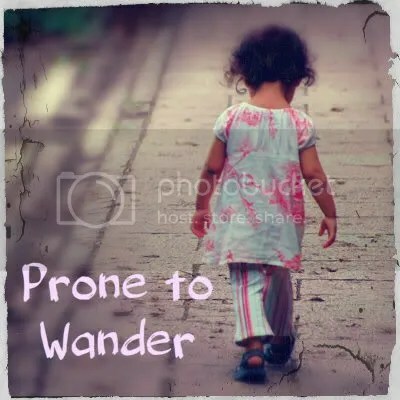 “Prone to wander, Lord, I feel it…” I’ll try to keep the wandering to a minimum…as long as I’m wandering towards God, towards His joy, and towards the better, make that best, choices. Let’s chat. Like me, are you prone to wander? What do you do when you realize you’re still on God’s path, but you’ve stopped to smell the roses for a bit too long? Will you pray for me? How can I pray for you? If I’d been more serious about writing a book years ago, I’d have a much cleaner house. No, not because I would have sold millions and been able to afford a full-time housekeeper. The good news/bad news is that I could have accomplished the turbo-clean without publication. It seems that all I have to do is sit at my computer, lift my hands to the keyboard a la concert pianist, and dust bunnies start multiplying before my eyes. I notice the coffee cup rings on my desk, the cat hair floating lyrically to the brick floors, the sun glistening on the polished wood floors which are almost now evenly covered with their protective layer of microscopic crud, the open-mouthed toilets–not even in view–are taunting me. Yesterday, after 30.6 seconds in front of the monitor, I pounced up to (gasp) vacuum. And (double gasp) I walked/ran on the treadmill. Writing is lonely. Not counting the three mildly neurotic cats (save me the animals reflect their owners psychobabble….you’re doing it anyway, aren’t you? ), it’s just me, my lukewarm cup of coffee, and stacks of papers. Not that I’d want an audience. Might make for a quirky SNL skit though. Massive desk, state of the art computer, spotlight on the keyboard, writer dressed in tuxedo (yes, women can wear tuxedos) slowly walks on stage, gently slides back ergonomically designed chair, flips on the monitor and starts his/her fingers dancing on the keyboard. The audience follows his/her progress on the large screen projected to the right and back of the writer. Chapter ends. Applause. But, seriously, what I did not understand until I came to the keyboard in pursuit of writing with the intent to actually produce something publishable, is that while I may be surrounded by external silence, my head is crammed with uninvited guests. In one corner, the petulant children whining about where they’d rather be, asking why we’re spending so much time sitting in this boring room when it’s really such a pretty day outside and we could being doing something like pulling weeds. In another corner, the brats who are causing all sorts of trouble with house cleaning distractions, playing with the telephone reminding me of calls I should be making, telling me I need to compulsively check my email because the editor whose name I added an extra “s” to might be knocked off his chair by my query, completely overlook my written lisp, and be attaching a contract AT THIS VERY NANOSECOND (brats scream…yeesh). And somewhere, roaming around aimlessly, is the worrywart aunt, wearing mismatched ankle socks with her orthopedic shoes, wondering about the physical and mental healths of my immediate family, genoicide, taxes, and world peace. The worst of the pack is the sneering and arrogant bullies, rocking back on their chairs asking me who I think I am that I could be on a bookshelf with the likes of ___________(insert almost any author’s name here), don’t I know that I’m justateacher. Just when I quiet everyone else, one of the bullies yawns and stretches to his/her nine feet tall self, looks at me, and laughs. It’s then I realize that the only way to shut them up is to drown them in words and sentences and paragraphs and pages and chapters. And when I’m finally there, I’m going to throw my book at them. So, is the choice being thin with an immaculate house and no book? Or lumpy with dust layers protecting the furniture and publication? Is that why book jackets rarely show full body photos of the writers? And how many writer’s cribs are featured on those house shows anyway? I just may be able to pull this one off. . .
A true Southern woman who knows that any cook worth her gumbo always starts with a roux and who never wears white after Labor Day, The Edge of Grace is Christa’s second novel. Her debut women’s fiction, Walking on Broken Glass, released in February from Abingdon Press. She is under contract for three more novels that will release in 2012 and 2013. She has been teaching high school English for over twenty years, earning her National Board Certification in 2007. The mother of five adult children and the totally smitten Grammy of two granddaughters, Christa and her veterinarian husband, Ken, live in Abita Springs, Louisiana. Visit her website at www.christaallan.com. You can connect with Christa at Facebook at http://www.facebook.com/ChristaAllan.Author. Check out Christa’s latest book! Apparently this is supposed to be comical; I think it's sickening. Yet it's less offensive that a picture of an actual kid cutting herself and less heart-breaking. This is actually a post I’m pulling over from my now defunct personal blog. It’s a couple of years old, but the message is still as true as the day I wrote it. I was perusing the Internet to see what hip new resources are out there for “kids” who cut. There were a lot of superficial one-pagers on health sites offering “advice” for questions that kids who cut ask like, how do I stop cutting? Why do I cut? Where do I get help? and so on. As a recovering cutter (we’re always recovering–it’s a long-life battle), I was a bit dismayed. There wasn’t a lot of great info out there for those who desperately need to know there’s hope–that, yes, you don’t have to use the razor tonight, feel ashamed when you wake up tomorrow, and feel that familiar sting as you clean the dried blood off your arms with antiseptic. Maybe you thought this was the time you cut so deep you wouldn’t wake up (or hoped you wouldn’t) or you wonder if a staph infection will set in and kill you outright. If you’re a cutter, recovering or active, know that there is hope tonight. You can be His, bought with His blood, healed because of His wounds, and loved because He Is Love. He desperately wants to show you how beautiful you are, to care for you, and to heal you from this habit that’s taken over your life. All you have to do is ask. Let Him takes these crimson ashes of shame and trade them for a crown of beauty. That being said, there are also a lot of mean people out there who think that cutting is some sort of hilarious joke. I’m 31 and started this deplorable practice when I was 14. I spent over half my life battling this demon that wants to tell me I’m not good enough, pretty enough, worthy enough–that I’m just not enough. 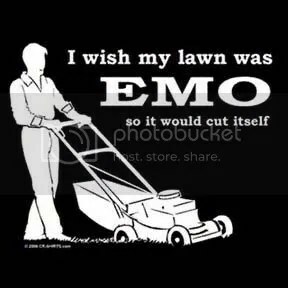 There’s nothing amusing or “emo” about it, at least not for me. True, cutting is sort of “trendy” these days, but back when I was in high school; it didn’t even have a name and no one knew how to treat it. Being one of the most difficult disorders to treat because cutting is the symptom of a deeper, darker issue, it’s a practice I wish teens would give up entirely. Don’t do it because your friends do it or to be emo or to write bloody poetry. When you turn 28, you’ll look at your scars with shame, wishing you could be that 14 year-old kid again–this time I’d throw the pink Lady Bic into the trash, and go on my merry way. But I realized that four years too late, and have wrestled with it since. I suppose if people want to mock, they can mock. I just hoped to enlighten their ignorance. Another “trendy” thing for cutters to do is ban together and support one another by posting pictures and being “proud” of their cutting. In fact, I found one site that has a “cutting challenge” each week. You can post pictures. I moved right along to another sad, slightly sadder, where people would announce that they cut, the extent of the injuries, and that they were sad. Others would offer *hugs* and what not. Then a few days later, the same person would post the same comment and it would happen over and over and over again. A cycle of cutting, gratification, and cutting. I don’t know who you are, why you cut, or how you wandered upon this post, but I am praying for you right now. I am praying that you fight the urge, find the strength, and maybe change the course of your life. Hope is just around the corner and love is right here waiting for you in a God who loves you and wants to heal ALL your wounds, not just the ones on the outside. If you want to know God personally, here’s a link to help you get started. Or please feel free to e-mail me with any questions. Vulgar e-mails/comments will be ignored and deleted. I’ve also written a bit on this topic, including resources for parents and youth workers. Please e-mail me if you’re interested in any of these materials. Also, To Write Love On Her Arms (twloha.com) is a great place to find help and support. While I have not garnered many new writing techniques from my creative writing class, I have undergone a tremendous amount of self-discovery. In this discovery of self, I have learned to find my “voice” as a writer (which I talked about last week on Atypical Musings). According to my writing instructor, a writer’s voice is “how you write when you don’t have time to be elegant”. As such, it is apparent that I’m trying to make Backseat Writer something it was never intended to be—mundane. I stated earlier this year in my New Year’s resolutions for the site that I wanted to be more personal and maybe a little more opinionated. 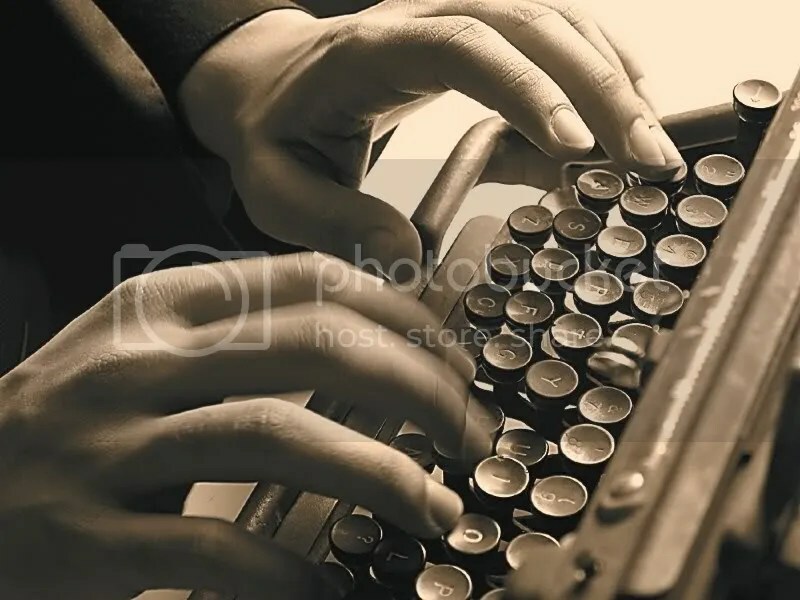 I realize that I am trying to make Backseat Writer some big publication that can compete with the likes of high level independent media websites. Not only is this goal unattainable (I am only one person), but it’s also not fun. I always tell myself that I will give up Backseat Writer when it stops being fun. Well, it’s not fun anymore. So either I have to make it fun or give it up. Since I’m not giving up the site, I realized that my desire to be more honest in reviews comes from my writing voice. My voice is one of raw honesty and sensitivity. Therefore, instead of trying to elicit big name interviews, do a ton of book and CD reviews just to compete in the market, I’m going to do what I set out to do—be a voice in the world, and not just any voice, my voice. There are things I’ve been afraid to post here. I wonder, “How would that look professionally? Can I post a silly video? Or talk about my struggles with mental illness? How does that affect the whole of Backseat Writer?” It’s become painfully obvious to me that an interview with an artist or a book review or anything I else I write comes out of the same voice, the same person, the same struggling beautiful mess. Why should I separate these voices? Perhaps it is my battles with depression that make my interviews better or book reviews deeper. I am not just half a person, but a whole person. Therefore, I am going to attack Backseat Writer as a whole person using my full voice. Maybe it isn’t as professional, maybe it won’t land me that dream writing gig, but at least I’ll have fun. And that’s all I truly set out to do. True Confessions Friday:: I’m the Queen of Typoland. If there was such a place as Typoland, I’m fairly certain its citizens–the Typos–would make me their queen. I don’t know how and I don’t know why, but for the life of me, I do not see the typos in my own manuscripts. Sometimes Backseat Writer readers will e-mail me about egregious errors or a snarky comment leaver will leave me a snarky comment pointing out all my typos (FYI: I delete or edit these comments). I’ve done everything to keep typos at bay–read the document several times to myself, then out loud, I run spell check, have a friend look it over (at which point, I’m fairly certain my friend is to blame, not me)…and these little buggers still get through my line of typo defense! I’m a fairly good speller, usually getting 100’s on my spelling and vocab tests in school. I type fast so can get my thoughts down and, loyal readers, you’ve seen the results–sometimes its” become “sit” and “I go to the park” becomes “me go park.” I just want you to know that I try my very hardest to provide you with good typo-free posts. There are probably six or seven typos in this post alone. Stuff Christians Like (SCL) is a fast-growing site that takes a satirical and honest view of Christian pop culture. Started in March 2008, site founder Jon Acuff decided to put an evangelical twist on the wildly popular blog, Stuff White People Like. Writing with wit and sensitivity, Acuff has engaged readers with over 500 (almost 600) insightful posts on what Christians like such as Rob Bell, comparing Braveheart to Christianity, metrosexual worship leaders, and counting swears in movies. SCL works because not only is Acuff young enough to be relevant and relevant enough to know what it means to be relevant, but also because his posts are saturated with sincerity and humility. And because he’s a super guy, Jon Acuff agreed to Take 5 with Backseat Writer when he could be writing about how Christians like to write blog posts about other Christians (or hanging out with his wife and daughters). *You wrote that you started Stuff Christians Like to take a look at the misconceptions, preconceptions, and conceptions in general about the church. Why do you think it’s important to clear the air about Christianity using the SCL as a forum? To tell you the truth, I didn’t initially think it was important. I have about 40 different URLs registered, ranging from bad ideas to even worse ideas. And when I started stuffchristianslike.net I thought it would be another idea I wrote about for a few weeks and then quit. But when people started reading it, a complete surprise to me, I felt like I was not alone in wanting to explore faith and the culture we’ve created around it with humor and honesty. *By using humor, you offer a softer approach to topics that are generally off-limits. Not only that, but your commentary about the Church is constructive in nature. Plus, you even use the Bible, something that I don’t see a lot of satirists doing. How has this approach been helpful for those who have been hurt by the Church? Part of the approach has been learning from my mistakes. Early on I made the mistake of writing about individuals instead of issues or ideas. After a few posts where I felt like I unfairly and without a whole lot of love picked on people I started to realize that it’s hard to write a blog without following Christ’s command that we love other people. There are too many Christian Jerk blogs out there and I decided that even though I had blown it a few times I wanted to be hyper deliberate about not being a jerk. So I think a big part of the approach is that the only person I try to point a finger at is me. Ways I’ve been wrong about God or the church or faith and then exploring those in hopefully a funny way. I try to never mock. The Bible is chock full of verses about how much God wants to drop the elbow of death on mockers, so I try to avoid that. Although I still make mistakes with what I write. *I imagine when writing some of your posts, you know that you’re going to push buttons. What makes you hit “post” anyway? There are some posts that I’m really terrified about posting but in some ways I hope I never get numb to that. I don’t think it’s easy being honest, especially when the stakes are higher and there’s a part of you that worries about people you know seeing what you wrote. But the biggest criteria I use when picking topics is, “Is this true of my own life?” If it’s not, if it’s not something I struggle with or think is funny in my own life I don’t write about it. So that makes it easier to say things that might be hard to share. If that’s what is going on in my life then I’m not presenting some crazy idea, I’m sharing my life. *I know there’s a book a’coming in March 2010. How did the book deal come about? When people started reading the site I contacted a literary agent that a number of people suggested named Chip MacGregor. I had a conversation with him and sent him my blog traffic numbers. We put together a proposal and he shopped it around to a few different publishers. Zondervan seemed like a great fit and when they offered a chance to publish Stuff Christians Like I was really honored by the opportunity. *Sometimes I think it’s harder for women who write satire/humor to find success, especially in Christian circles. Do you think this is true? Why or why not? I love that when the other nations saw the laughter, when they noticed the laughter they couldn’t help but say, “The Lord has done great things for them.” That’s why I try to get people to laugh. It’s been getting a little melancholy and a lot controversial ’round these parts lately, so I’m gonna take things down a notch. There are a lot of other bloggers/writers that influence my thought life, and more importantly, my spiritual life. One of these people is author and blogger Jonalyn Grace Fincher. I stumbled upon her by accident through reading one of her husband, Dale’s books (Living with Questions). Dale and Jonalyn also run an organization called Soulation, which teaches others how to be appropriately human. Jonalyn’s writing is both personal and strong. Last year, she took readers with her through as she worked through all the despair and disappointment of having a miscarriage. Her posts are intelligent and well-written provoking thoughts among Christian woman about our true God-given roles. In her most recent post, Jonalyn captures the essence of the female fanaticism behind Twilight, as well as other popular characters delving into romance. Please head on over to her blog to read “When Perfection is Un-Human“. As usual, Jonalyn gets to the heart of the issue, which is a woman’s heart.